On August 10th & 11th in Ottawa, the Canadian Federation of Business and Professional Women (BPW Canada) hosted two events, one at the Global Centre of Pluralism and the other at the Fairmont Chateau Laurier to gather defenders of human rights and to shed light on the global goals and priorities that countries have already agreed upon. Ottawa, Canada, August 16, 2018 — On August 10th & 11th in Ottawa, the Canadian Federation of Business and Professional Women (BPW Canada) hosted two events, one at the Global Centre of Pluralism and the other at the Fairmont Chateau Laurier to gather defenders of human rights and to shed light on the global goals and priorities. “Equality, justice and freedom, these are important to all of us because they sustain peace and prevent violence. Our shared humanity is embedded in these universal values. Whenever and wherever these values are abandoned, we are all, as a society, at a greater risk,” said President Jenny Gulamani-Abdulla at the Opening Ceremony and Reception held at the Global Centre For Pluralism. Mayor Jim Watson acknowledged the venue, its relevance and the work of the Aga Khan Development Network. The Mayor, Chief Commissioner Marie Claude Landry of the Canadian Human Rights Commission and Minister Counsellor Else Kveinen from the Royal Norweigan Embassy all stressed the importance of collaboration and partnerships among stakeholders to promote human rights for all. In addition to the Anniversary Celebration, the SDG Gala held the following day highlighted the 17 Sustainable Development Goals featuring a keynote address by the first female First Nations Senator of Canada, The Honourable Lillian Eva Dyck with remarks from Councillor Marianne Wilkinson and the 2017 Recipient of the BPW Canada Centennial Award, Carleton University’s Centre for Women in Politics and Public Leadership’s Executive Director Clare Beckton. 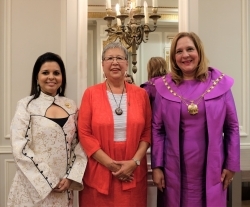 The two events were part of BPW Canada’s 46th biennial national convention which was being held in Ottawa for the first time since 1964. BPW Canada is an 88-year-old non-profit and non-partisan network of over 500 business and professional women nationwide who effect positive change through empowerment of women and girls. It is part of an International Federation with almost 35,000 members globally and holds General Consultative Status at the United Nations Economic and Social Council. BPW Canada has been showcasing achievements of women while working to address challenges. In 2016, it recognized the efforts of 100 Women’s organizations across Canada during the Centennial Year of Women’s Suffrage; In 2017 it celebrated Canada’s Sesquicentennial with 23 BPW Visionaries who took their seats around the Confederation Table in Charlottetown. This year, it focused on those promoting and defending human rights as well as presented a Leadership Award to its member, Jami Young.